So I have been having soy in my coffee far more often, and found myself CRAVING ….so eating a bowl of seaweed with sesame seeds/ sesame oil dressing last night – don’t think the two are linked.?!!.. think again..certain foods that actually have a goitrogen effect (that is, they suppress the thyroid). Soy is the biggest offender. Even cruciferous vegetables – (think kale broccoli and caulifower) when eaten raw, can be an issue (this is why I subscribe to a hi-RAW diet more on that later too). Things that support the thyroid, iodine rich foods..the richest… seaweed & oysters and selenium rich foods like brazil nuts, pumpkin and SESAME seeds, of course the added benefit of the sesame seeds is the big calcium hit! Sesame are one of the richest sources of calcium you can eat. Lesson – my cravings are always bang on! 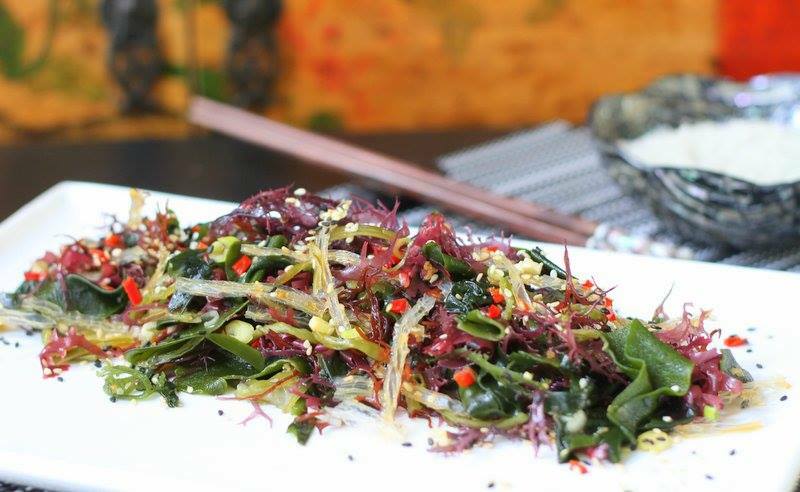 So go with your “gut”… if you have a clean system (ie Tim Tams, coffee and wine aren’t REAL cravings, more on that another time) the seaweed salad, its delicious. Put the dry seaweed in a large bowl and fill it with cold water. If you like your seaweed crunchy, soak it for 5 minutes, if you like it more tender, soak it for 10 minutes. To make the dressing, combine the rice vinegar, sesame oil, nama shoyu, agave, salt, toasted sesame seeds, ginger and chilli in a small bowl and whisk together. Drain the seaweed and use your hands to squeeze out excess water, pat dry with a paper towel. Wipe out any excess water in the bowl, and then return the seaweed along with the dressing and sesame seeds and spring onions. Toss thoroughly to combine. Plate the salad and garnish with black sesame and spring onions. Note – Asian supermarkets sell mixed seaweed, mine is Wakame, Kuki Wakame, Agar (the white ones), Suginoriao/Shiro, it is from my local big Asian store and is derived from Korean waters.